Seems like the city giant HAL just waked up in time and thrashed Golden Threads 5-0. In the other match played today, Titanium held BEML to a 1-1 draw. The other city team wasted many chances to gain the top spot in the group A.
HAL shrugged-off the bad memories of the last two matches, they meant business right from the offset. Nigerian striker Fredrick Okwagbe drew the first blood in the 12th minute of the game. Right through the first-half, the ball was mostly seen in the Golden’s end. In 24th minute, Satish Kumar (Junior) missed one easy chance to score from a defense scuffle. HAL took a 2-0 lead in the 40th minute from a corner. 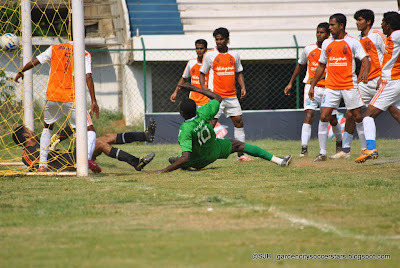 Rajendra Prasad’s corner was initially received by Xavier Vijaykumar, which was relayed to Fredrick, and Fredrick’s powerful header was good enough to gave his team a 2-0 lead. Couple of minutes later, HAL keeper Amar Deb made a complete mess of the situation. He missed the flight and couldn’t hold on to the ball. The goal was unguarded; it could have been a goal for Golden, however, the Golden striker failed to connect the ball. HAL today displayed a much improved game. They started the 2nd half with same urgency to finish match in style and was it clearly evident in all the departments. Meanwhile Fredrick scored his hat trick in the 4th minute of 2nd half. HAL should have scored few more goals. Fredrick and mid-fielder Jotin Singh came very close to scoring. In many occasion, HAL toyed with rival’s defense - but either failed to get past the keeper or put the ball away from the goal. To keep the resources fresh, skipper Xavier along with few other key players were replaced in the early 2nd half. Gopi, who replaced Xavier scored the 4th goal in the 88th minute. Medio Vishal Kumar tried passing the ball to Gopi, Golden keeper failed to grab the ball, miscues it, finally Gopi snatched the ball the placed to the goal. It was Gopi again who scored the 5th goal. In the 92nd minute, Jotin Singh took a shot, which was bounced by the keeper, an alert Gopi collected the ball and placed to the opponent’s goal. It was an exhibition of missed chances displayed in the BEML – Titanium match. BEML dominated the first-half, however, they failed to convert from the many chances that came their way. BEML midfield suffered a blow when veteran Mahendra Mani was replaced at the later stages of the first-half. Hayath Khalander was brought in at the central midfield position. Hayath, who primarily plays as an attacking midfielder was effective in the first half. BEML took lead in the 55th minute, a penalty was awarded to BEML when Cleetus handled the ball inside the box. Defender Alesh Shamaki made no mistake in placing the ball to the extreme right of the goal. Mani’s service was majorly missed in the 2nd half. There was no one to hold the ball for BEML; there was a flurry of attack from Titanium from the middle. In the 65th minute Boniface crossed the ball for Abdul Hameed, Hameed to the much delight of Titanium, headed the ball to the goal. A win should have ensured BEML a birth to the final round of the 2nd division I-League. Now, much would depend on the outcome of the result between tomorrows match between, Malabar United and SBT. HAL plays their last match of the group against SBT on next Wednesday, April 14, 4 pm. BEML plays their last match on Thursday, April 15, 4 pm. 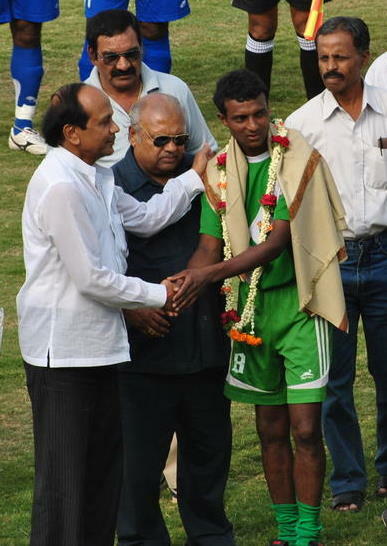 KSFA today felicitated HAL captain Xavier VijayKumar, winner of the Karnataka State Government’s Ekalavya award for the year 2008.